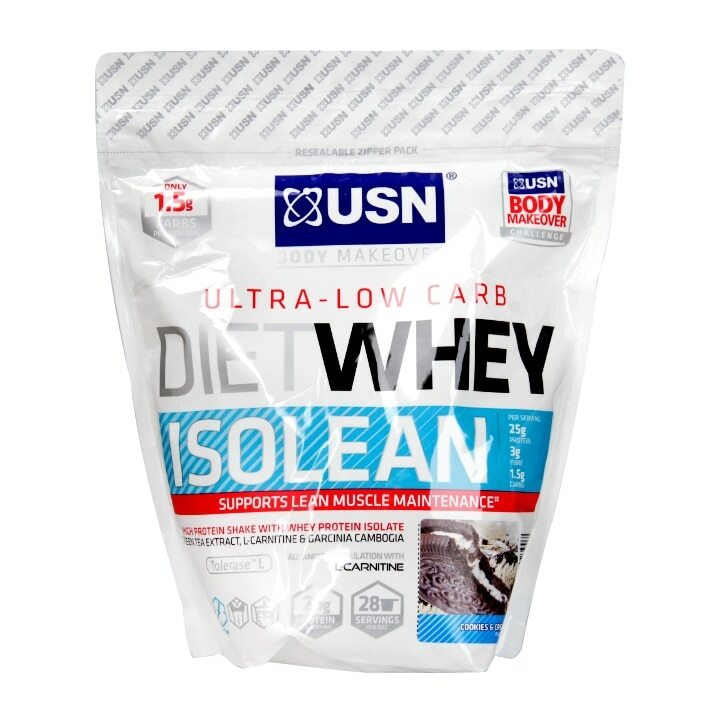 USN Diet Whey Isolean Cookies & Cream is rated 3.9 out of 5 by 8. Rated 5 out of 5 by Liv W from Loooove this Not grainy like most shakes. The people saying it’s too watery put too much water in. for a thicker consistency use 150 ml of water and it’s like milkshake. Lovely flavor for someone who has a sweet tooth. I use after the gym for sweet cravings and sorts me right out. Rated 4 out of 5 by MadridSports from Good taste Good taste powder and textures even been a Diet product, what I consider a double good thing. I recommend this whey powders. Rated 1 out of 5 by Trinity blue from Watery and too much artificial sweetness. Bought this a couple of weeks ago in half price sale. Wish I hadn't even spent half the cost. This product is far too sweet, especially since it is a diet replacement meal drink. the shake is supposed to be made with water but it makes a very watery drink which is not nice At all. It has an overly artificially sweet taste which is just uneccssary. Made with milk it is possibly ok to drink as the milk reduces the artificial taste and the texture is nicer. However it is still not as thick or creamy tasting as other diet shakes I have dried n the past. If you want to try this product just try the small pack first. Don't invest the money for the large pack. I wish. Hadn't. Rated 2 out of 5 by Dintle from Taste horrible I bought this looking forwad for a great taste. It taste horrible, its too watery , I Try to put 2 scopes it doesn't thicken. Waste of money.